I’m a big supporter of the B.C. Archaeology forum and posted about it a while back. The forum is an annual gathering of archaeologists, students, First Nations and others with an interest in B.C. Archaeology. It’s a rare chance for all the different stakeholders to get together, catch up, and socialize. This year the forum is co-hosted by UBC and the Musqueam First Nation, and will be held near SW Marine Drive (i.e., not on the UBC campus: map). Since I am getting tons of hits from google queries looking for information about it, and since this can also serve as a reminder to get out to the forum this Saturday, November 6th, I am pasting in the program of events below. Remember, everyone is welcome. The registration fee is only 20$, and half that for students. You can walk up to register on Saturday morning. It would be most welcome to see lots of public and community members there. The program (PDF) (I refuse to call it an agenda) is pasted in below with some comments. There is an introductory address (in this case scheduled for forty minutes!! ), followed by reports from Universities on field schools and other activities, and by agencies and companies. Then there are more topical papers including, in addition to site-specific talks, presentations on data repositories, intellectual property, on violations of the Heritage Conservation Act and by Wayne Point of the Musqueam, on archaeological monitoring. The latter is a process by which archaeologists are hired, after a project’s impact assessments have been done, to watch the disturbance of the earth by, say, a backhoe. This is a fail-safe procedure to ensure nothing was missed by shovel testing or other evaluation, or, in some cases, to watch the actual destruction of part of a site when that has been given the green light. I’ll be interested in seeing why this is being brought forward by the Musqueam. Anyway, it looks like a great program and thanks and congratulations to those who worked hard to put it all together. 11:40 ‐ 12:30 Dave Schaepe (SRRMC), Lenore Thompson (Millennia), Sue Rowley (UBC Panel Presentation: Repositories and Data Access. Followed by discussion period. 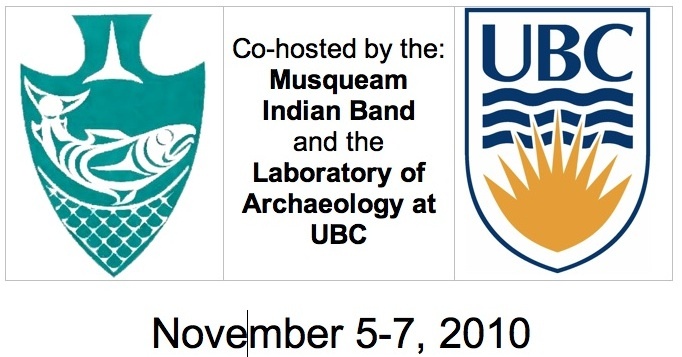 This entry was posted in Archaeology, Cultural Resource Management, First Nations, Northwest Interior, Northwest Coast and tagged bc archaeology forum, conferences, Musqueam, ubc. Bookmark the permalink. You pose your comment that you’re interested to see why this is being put forward by the Musqueam as though you have some underlying opinion about us. Not at all, what I meant by that was I was interested if there were some recent issues about monitoring or experiences good or bad arising in Musqueam territory that would have prompted the presentation to be given by Wayne Point. Monitoring can sometimes be when unexpected (or should-have-been-expected) finds come to light and so my comment was driven just by curiosity to see why it was being highlighted at the archaeology forum. I was thinking, maybe there were new protocols for monitoring, maybe there had been a recent unfortunate event I hadn’t heard about, that sort of thing. Sorry if it came off with the wrong tone – it wasn’t driven by any pre-existing underlying opinion of the Musqueam. Hello, I believe I’ve almost absolutely positively found something using Google Earth that I believe, based on my extensive experience in ground school training and flying with my cousin who has his own personal craft, meets ALL of the conditions a priori for being absolutely without a doubt, based on the geometry and obvious characteristics of intelligent design, an Antarctic debris field that is evidence of ancient civilization and merits immediate investigation (or demands for disclosure from our governments). The site(s) are VAST and easily found by anyone with Google Earth by going to the co-ordinates:66°14’23.66″S & 60°49’00.47″W. There MUST be some Archaeologists out there or a hundred, who would wish to jump on this. I only ask that I be allowed to come along and film it, as I’m an Emmy Winning Film & Television PrEditor (producer, writer, editor). Maybe you can name somethings for me, hahaha ;P Cheers!